Well, that came quick! We’re thrilled to now be launching our third and final batch of Chalcid slides on Notes from Nature! Thank-you to everyone who gave us feedback about how we might make this last set easier to transcribe, with some additional information about where to find the required data on the labels. 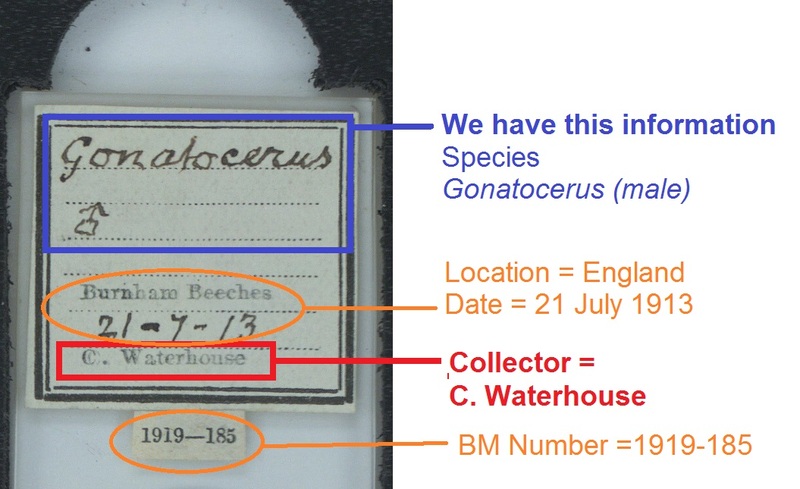 There are three collectors in particular who have made a very large contribution to this collection, so we thought it might be useful to highlight their slide labels and point out some information that might have been hard to interpret. John Noyes is a recently-retired colleague at the Natural History Museum who we still regularly see in our collection room pursuing his love of studying the Chalcidoidae – in fact he created a database that you may find to be a valuable resource when puzzling out scientific names: http://www.nhm.ac.uk/our-science/data/chalcidoids/. We like how neat and tidy his slides always are! Sydney Charles Scarsdale Brown lived in Bournemouth, and seems to have gone on lots of local jaunts to collect the Mymaridae, using Malaise Traps. 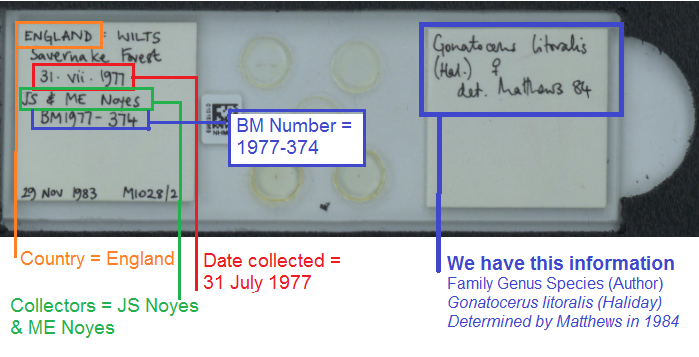 You can learn more about him in our post The Dentist who collected Fairyflies . His slides are some of the most frustrating in the collection because they’ll get your head flipping from one side to the other, but once you know that there are typically only a few pieces of data we need here, they are much easier to process. Charles Waterhouse was an Assistant Keeper at the Natural History Museum, and seems to have preferred Richmond and Burnham Beeches to go on his collection trips for the Chalcidoideae. His slides will often have nicely printed labels with old fashioned hand-writing and a neatly typed British Museum registration number. 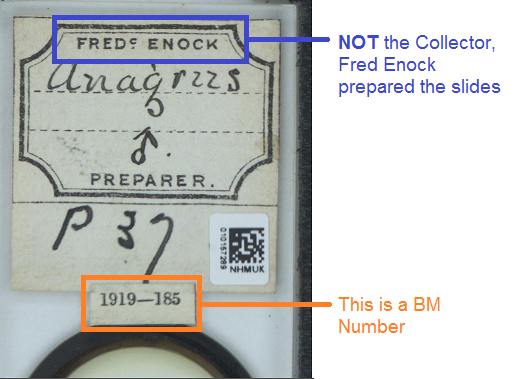 You will also see many slides that have been prepared by Fred Enock, who worked at the Museum at the same time as C. Waterhouse, and was an Entomologist in his own right – naming many species (see if you can spot ‘enock’ written after any of the scientific species name on some of these labels). 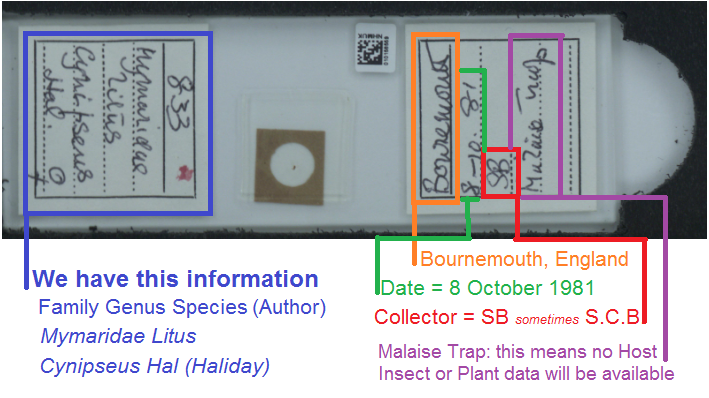 But more commonly found in our collection will be his preparation labels, where he is NOT the Collector. He’s quite an interesting person who we know a fair bit about – so keep your eyes peeled for a future blog post!